Despite suggestions he is the subject of interest from the Foxes, Brendan Rodgers is focused on the job at hand. BRENDAN RODGERS INSISTS his focus remains on Celtic despite reports of interest from Leicester City. Leicester sacked Claude Puel on Sunday after a 4-1 home defeat to Crystal Palace the previous day, with Rodgers already tipped as a potential replacement before the news was confirmed. And reports subsequently emerged suggesting the Foxes would be prepared to wait until the end of the season to get the Celtic boss, who is the early odds-on favourite to land the job. However, Rodgers, who has won seven major trophies in under three years with Celtic, was not willing to entertain speculation ahead of the 4-1 Scottish Premiership home win over Motherwell on Sunday. “My job is to concentrate on the football aspect, and that is with Celtic,” Rodgers told BBC Scotland. I’ve been stood here for two-and-a-half years and I’ve been asked similar questions. My message is always very, very clear: I’m very concentrated on the game. 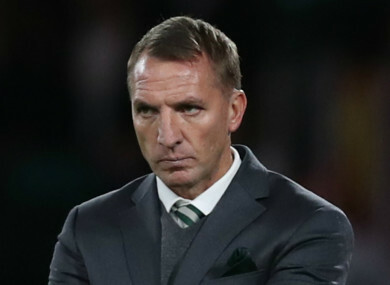 Rodgers has previously managed in the Premier League with Swansea City and Liverpool, while he has also been linked to the Newcastle United job. First-team coaches Mike Stowell and Adam Sadler are in temporary charge of Leicester as the club look for a new boss. Email “'I'm very concentrated on the game': Rodgers committed to Celtic amid Leicester links”. Feedback on “'I'm very concentrated on the game': Rodgers committed to Celtic amid Leicester links”.